August 4, 1914, Britain declared war on Germany. As a member of the British Commonwealth and without its own independent foreign policy, Canada entered the war providing support to the British war effort. And support we did! By war’s end, some 619,000 Canadians had enlisted in the Canadian Expeditionary Force for service overseas. This was an enormous contribution from a population of just under 8 million in 1914. 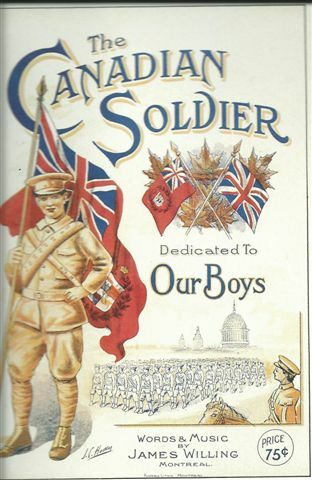 Approximately seven percent of the total population of Canada was in uniform at some point during the war, and hundreds of thousands of additional Canadians worked on the home front in support of the war. Of these nearly 60,000 died during the conflict and almost another 6,000 died as a result of war related injuries after the war ended. Those who did not fight in Europe but stayed home were also a large part of the war effort. Working in war munition plants, buying savings bonds, rationing and recycling, knitting and in many cases just doing without was a life style on the home front. This “Great War” changed Canada forever. St. Clair Township, then Sombra and Moore Townships, answered the call to support the mother country. Over 400 men, from a population of around 5000, joined the CEF during the 4 years of conflict. Many joined the Lambton 149th Battalion. It did not fight as a unit battalion but rather became a replacement battalion for units whose numbers had been depleted in battle. When peace was finally declared on November 11, 1918, 36 community sons had made the supreme sacrifice fighting for their country. Many others, who survived, lived a life time filled with horrible memories. We as citizens of this community owe these brave souls a never ending thanks. The attached document (Click here or the link of the left for the document in pdf format) is a collection of names of men from the former Moore and Sombra Townships who were part of the Canadian Expeditionary Force. The list includes men who were born in this community or who may have moved here after the war. While exploring Archives Canada, the viewer may find that the soldier’s service file has been digitized and displayed. The document is a working document. Some solders have no information listed. They have been identified but as yet no information about their service has been discovered. If readers find errors or have further information to contribute, it should be considered. If family members have pictures of a soldier, the Sombra Museum would like a copy, which will be part of a WW1 data base. These pictures can also be inserted into the Canadian Great War Project. If there are personal artefacts related to the soldier’s involvement in the war and family would like to share these, the Sombra Museum would like to display them. If there are names that have been missed it is important that they be included in the list. No soldier’s participation should be missed.